During a family event in December 2005, former baseball pitcher Curt Schilling approached his wife’s uncle with an idea to start a videogame company focused on developing a massively-multiplayer online roleplaying game, eventually forming Green Monster Games (later renamed 38 Studios in honor of the pitcher’s jersey number) in September 2006, originally basing the company in Massachusetts. 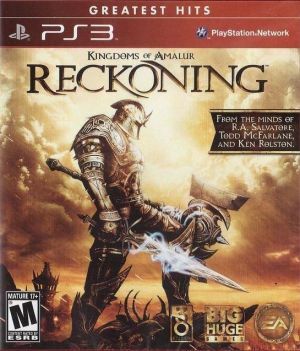 In July 2010, the quasi-public Rhode Island Economic Development Corporation offered a loan for the company to relocate and bring jobs to the State, with its first and only title under the arrangement, downgraded to a single-player RPG, being Kingdoms of Amalur: Reckoning. Did the ultimate product justify the loan? Amalur allows the player to create a character of one of four different races, who fights alone in real-time combat, with no companion AI to worry about. Leveling lets players to invest a trio of skill points into three class trees, unlocking new abilities and greater attack power with specific weapon types, among other things. Certain equipment requires the player to have invested a minimum number of points into the trees, and both weapons and armor have durability that declines with use and damage, repairable at shops. Combat is generally responsive and enjoyable, with little to complain about aside from an occasionally-finicky camera. Perhaps the game’s weakest aspect is its control, with frequent loading times when quick-jumping to visited areas and transferring between fields and dungeons, and some lag in the menus themselves, with the selling of excess gear somewhat laggy, too. Inventory also has a limit, although one can increase it occasionally with sacks sold by certain merchants, although scrolling through the shopping interfaces, given the aforementioned delay, can be somewhat tedious. The maps, while mostly helpful, don’t actually hint at the goods sold by particular merchants, whether armor, weapons, or consumables. The game mostly allows players to save their progress anywhere, a case with most Western RPGs, although other aspects of interaction the developers could have given a once-over. Fantasy author R.A. Salvatore wrote the game’s lore, and it shows, with superb backstory and mythos expanded upon in conversations even with trivial NPCs, and the protagonist the player creates isn’t completely blank-slate. There are some occasional errors in the text, but the narrative is definitely one of Reckoning’s highlights. Grant Kirkhope provided the musical score, which is decent, although it doesn’t have the memorability of Japanese RPG soundtracks, given some reliance on ambience. The voice acting is top-notch, however, and the game is generally easy on the ears. The graphics are also good for a PlayStation 3 game, with believable character models and quirks such as different equipment affecting the protagonist’s appearance, although there is frequent pop-up while the player is moving around the various environments and some bland textures at times. Finally, players can expect to spend a great deal of time with the game, about two days’ worth, especially if they embark upon the many sidequests, the trophies adding further lasting appeal. Overall, Kingdoms of Amalur: Reckoning was definitely a good use of the Rhode Island loan, given its many positive aspects such as the excellent single-character combat, the superb mythos, the solid voice acting, and the nice visuals. Granted, there are some areas that could have used more of the developer’s attention such as the laggy interfaces and loading times, the lack of memorability with regards to the soundtrack, and some graphical impurities. The game would fail to make back its budget, however, spawning an investigation from the State and leading then-Governor (and former United States Senator) Lincoln Chafee not to seek reelection, although given the quality of the title, he and other Rhode Island politicians involved in its financing had mostly nothing to be sorry for. This review is based on a playthrough of a physical copy purchased by the reviewer, played to the official ending with 38% trophy completion. +Solid single-character combat with no AI to worry about. -Menus somewhat laggy, with plenty load times, too. -The political fallout in Rhode Island.